start learning something new here: why keyboard is arranged as QWERTY ? why keyboard is arranged as QWERTY ? This layout was devised and created in the early 1870s by Christopher Latham Sholes, a newspaper editor and printer who lived in Milwaukee. With the assistance of his friends Carlos Glidden and Samuel W. Soule he built an early writing machine for which a patent application was filed in October 1867. His "Type Writer" had two features which made jams a serious issue. Firstly, characters were mounted on metal arms or typebars, which would clash and jam if neighboring arms were depressed at the same time or in rapid succession. Secondly, its printing point was located beneath the paper carriage, invisible to the operator, a so-called "up-stroke" design. Consequently, jams were especially serious, because the typist could only discover the mishap by raising the carriage to inspect what he had typed. The solution was to place commonly used letter-pairs (like "th" or "st") so that their typebars were not neighboring, avoiding jams. A popular myth is that QWERTY was designed to "slow down" typists though this is incorrect – it was designed to prevent jams while typing at speed, allowing typists to type faster. Sholes struggled for the next five years to perfect his invention, making many trial-and-error rearrangements of the original machine's alphabetical key arrangement. His study of letter-pair frequency by educator Amos Densmore, brother of the financial backer James Densmore, is believed to have influenced the arrangement of letters, but called in question. After it purchased the device, Remington made several adjustments which created a keyboard with what is essentially the modern QWERTY layout. Their adjustments included placing the "R" key in the place previously allotted to the period key (this has been claimed to be done with the purpose of enabling salesmen to impress customers by pecking out the brand name "TYPE WRITER" from one keyboard row but this claim is unsubstantiated). Vestiges of the original alphabetical layout remained in the "home row" sequence DFGHJKL. The QWERTY layout became popular with the success of the Remington No. 2 of 1878, the first typewriter to include both upper and lower case letters, via a shift key. Much less commented-on than the order of the keys is that the keys are not on a grid, but rather that each column slants diagonally; this is because of the mechanical linkages – each key being attached to a lever, and hence the offset prevents the levers from running into each other – and has been retained in most electronic keyboards. 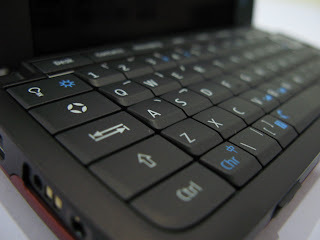 Some keyboards, such as the Kinesis, retain the QWERTY layout but arrange the keys in vertical columns, to reduce unnecessary lateral finger motion.